A rehearsal for Earth Oven Tales (part of the Martineau Gardens Storytelling Festival on Fri 22 and Sat 23 June 2012) took place today. Our ‘outdoor kitchen’ is one of a series of ‘stages’ that storytellers will perform in during the festival. A yurt, a marquee, a pirate ship, a bell tent and woodland glades located throughout our 2.5 acre community garden, will become venues for dramatic performances. 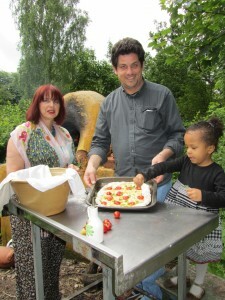 Storyteller Catriona Heatherington (from the Traditional Arts Team) was joined by Antonello Turco, Italian chef, baked foccaccio (flat oven-baked Italian bread), in our Earth Oven. Pictures here, Antonello has topped the bread with herbs picked fresh from Martineau Gardens’ herb beds (with a little help from his daughter). Antonello is a chef and organic producer of Spumante, Vermouth containing 18 different herbs and Olive Oil. Passionate about tradition, he uses the highly prized “Black Flour” from San Marco, gleaned after the harvested field has been burned. True to his organic roots, Antonello uses the only flour that he can be certain has not been genetically modified. During the festival, Catriona and Antonello will capture the taste, history and stories of Southern Italy.